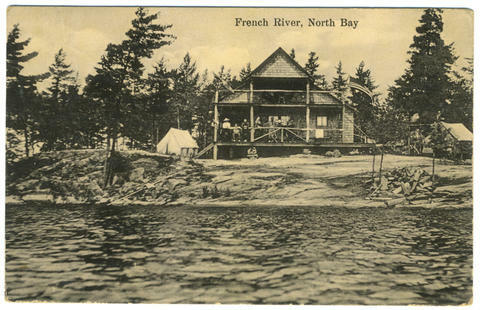 Item 021 - French River, North Bay. Published by H. S. Campbell, North Bay, Ont. Card is cancelled at North Bay?. Card is addressed to: Miss Beatrice Griffin. 262 Bridge St. Northampton Mass. Message reads: AUG - 23 - 1910. We are way up here in the wilds of Canada. plenty of Indians running around. Love for all. Ned V. Macttea?